RK type | Products Lineup | Products | NIPPON BEARING CO., LTD.
NB SLIDE ROTARY BUSH RK type is a highly accurate and high load capacity bearing providing smooth continuous linear and rotational motions. Its structure imposes no constraints on linear and rotational motions. 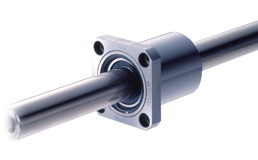 It is much more compact than a standard slide bush with separate rotational bearing. The NB SLIDE ROTARY BUSH RK type uses a retainer similar to that used in the SR type STROKE BUSH. This retainer gives a smooth motion in a high rotational application. SM type SLIDE BUSH is incorporated, providing the stable and smooth linear motion. Relatively large ball elements are used for high load capacity. A smooth unlimited linear and rotational motion is obtained. There is no need to machine separate housing. High accuracy is ensured for extended period of usage. Its high compatibility eliminates replacement problems. High rigidity enables it to withstand an unbalanced load and large load. ※Refer to page Eng-5 for the coefficients.